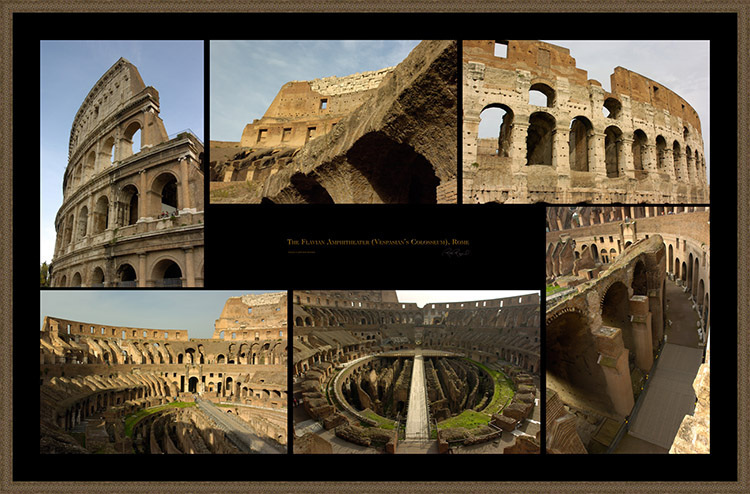 The Colosseum was first known as the Flavian Amphitheater. The building began under the emperor Vespian and was concluded under Titus. It was finished about 80 B.C. It became known as the Colosseum because it was next to agigantic statue of Nero known as Colossus. Romans would watch a slew of different things here as entertainment. Perhaps the most famous were the death fights of the Gladiators. There were also fights to death between the gladiators and animals. Other modes of entertainment that took place here were athletic events and perfomances by trained animals or acrobats. The Romans would also flood the Colosseum and have mock sea battles. It is said that in the first 100 days that the Colosseum opened that 9000 animals and 2000 Gladiators died for the amusement of the people.The floor of the Colosseum was covered in sand. Beneath the floor was an array of service rooms and tunnels that were used as a place to keep the animals, equipment, and a place for the performers to congregate and prepare. The amphitheaters careful engineering can be seen in the Colosseum. It had 3 levels of seats and a standing area on top that all allowed for an excellent unrestricted sight of the events. There were 76 entrances that allowed for the 50K people to be ushered in and out with little difficulty. From an exterior view the architect becomes more complex as you follow the Colosseum up.